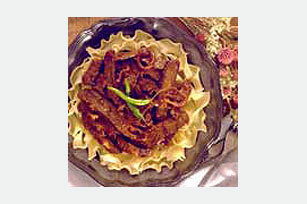 Steak sauce, mushrooms and garlic powder become a savory sauce to serve with tender roast beef slices and noodles. Preheat oven to 350°F. Mix steak sauce, mushrooms with liquid and garlic powder until well blended. Place roast in 13x9-inch baking pan. Top with the steak sauce mixture; cover tightly with foil. Bake 2 hours. Remove roast from pan onto heated platter; cover to keep warm. Pour mushroom mixture from pan into medium saucepan. Mix cornstarch and water; add to saucepan. Cook and stir on medium heat until mixture thickens and begins to boil, stirring frequently. Remove saucepan from heat; cover to keep warm. Slice roast. Serve with the mushroom sauce and noodles. Serve with hot cooked rice instead of the noodles.